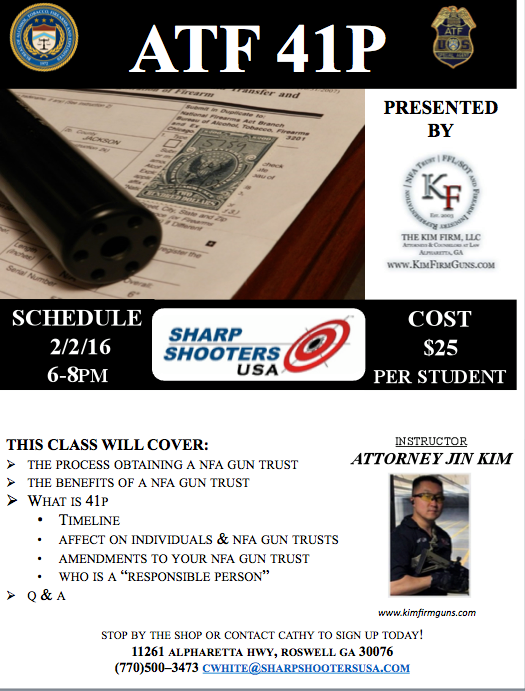 Kim Firm Guns very own attorney, Jin H. Kim, will be hosting an exclusive seminar on Tuesday, February 2nd from 6-8PM at SharpShooters USA in Alpharetta on the ATF’s 41P/F Final Ruling. Define the “Responsible Person” according to the ATF. If you said, “What is that?” to any of the above terms, want, have, or may be thinking about purchasing a short barrel rifle, suppressor, or any other NFA weapon, this seminar is for you. The cost is $25 per student and space is limited. If you have any questions or wish to sign up, please contact SharpShooters USA at (770)500-3473 or email them at cwhite@Sharpshootersusa.com. This entry was posted in Uncategorized on January 26, 2016 by rmuramaru. 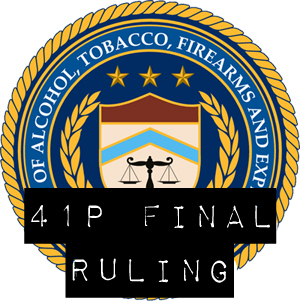 The ATF published their final rule on 41P on January 4, 2016. 41P will then change to 41F and become law 180 days after publication in the Federal Registry. (Edit: Publication is scheduled for January 15, 2016.) As stated in the ATF’s Final Rule, once the law takes effect, individual applicants and “responsible person(s)” of NFA Gun Trusts, Corporations, and LLCs will be required to provide Photo ID, fingerprints, submit to a background check and notify the Chief Law Enforcement Officer of their jurisdictions when registering to own or manufacture a NFA Firearm. The language of who is a Responsible Person can be debated based on strict reading of the language (person who manage or control the trust) versus the ATF’s intent (of anyone who will possess or transport the NFA firearm). It will ultimately come down to the ATF’s interpretation of who a responsible person will be. 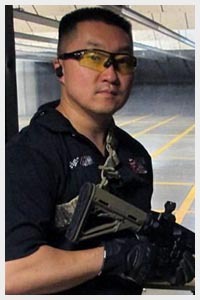 Please contact The Kim Firm, LLC if you have any questions about 41F or would like discuss your current NFA Gun Trust. This entry was posted in Uncategorized on January 13, 2016 by rmuramaru.